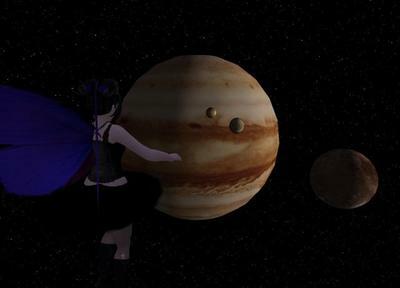 A few months ago, groundbreaking 3D builder and avatar fashion designer Aimee Weber decided to expand the limits of machinima too, creating a planetarium-worthy tour of the solar system within Second Life. It wasn't just the professional polish of the movie that struck me, but far as I can tell, it's the first fully-realized use of machinima for educational purposes. Rather than interview her, however, I asked her to blog a behind-the-scenes account here, as NWN's first contributing writer. Anybody who hasn’t been hiding under a prim for the last year knows that Machinima is what the cool kids in gaming are doing these days. If you haven’t heard of Machinima, I recommend you buy a pair of trendy sunglasses, have 8x10 glossies taken of your avatar, and tell your agent to call Machinima.com. Machinima is the growing art of using online gaming environments to produce movies. Like most budding technologies, early Machinima productions suffered from an acute case of self-awe by featuring movie plots along the lines of “Everybody look! You can make a movie with this platform!” But the honeymoon is over and it’s time to find substance in our love of virtual movie making. Enter Aimee Weber’s Tour of the Solar System. The idea behind the Tour of the Solar System was to use Machinima techniques to produce an educational film on a shoelace budget. While conventional techniques for making a computer generated educational films could cost thousands of dollars, I was able to create a highly informative video for little more than travel expenses to Pluto. Kidding! My producer said I had to wait until off-season if I wanted to get anywhere near the Kuiper Belt. The process began with a screenplay, which is essentially dialogue combined with cinematic direction. Like any blueprint, this simple document provides an early opportunity to iron out potential problems before they become labor intensive to fix later in production. I timed myself as I read the narration aloud to make sure the pacing would be comfortable for my audience. If a scene felt drawn out, or hurried, I rewrote it until it felt natural. 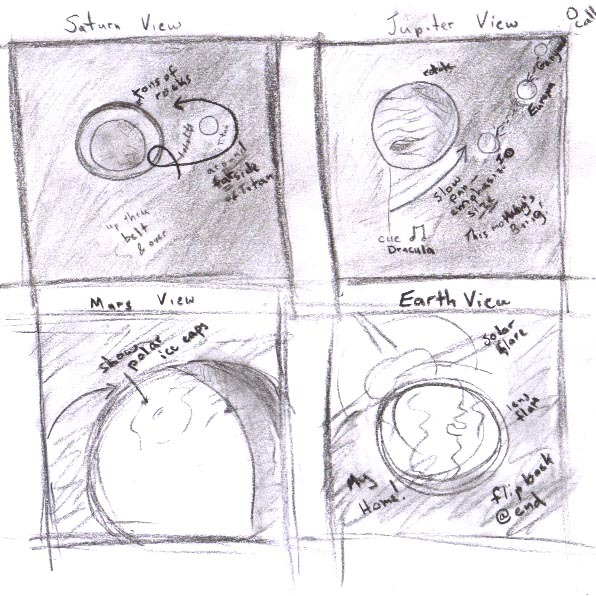 I then sketched a rough storyboard to provide direction for filming. Storyboards are helpful because they allow me to visualize the aesthetics and composition. Borrowing techniques from George Lucas, I decided the best way to captivate my audience was to zoom them around the planets as if they were in a fast moving spaceship. This motion became a useful tool to instill a sense of planetary size in my audience. For example, by zooming quickly around the planet Pluto my audience got a feeling that it was a small, easily navigated planet. On the other hand, by slowly panning around Jupiter I gave the audience a feeling that this celestial body was a massive force to be reckoned with. 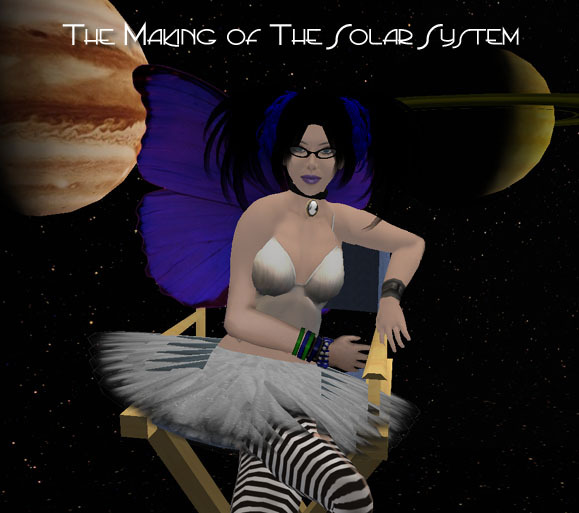 “In the beginning…” Ironically, it did take me about six days to create the solar system. I started by enclosing an enormous portion of the sim with a starfield backdrop. 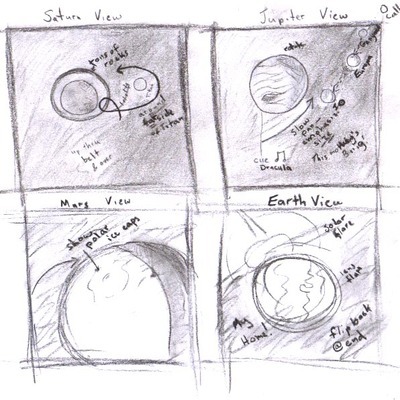 I then created the Sun, each planet, and all major moons. Many of the moons were not even mentioned in the movie, but if you look closely you can see some of them loitering in orbit. One scene featuring the planet Saturn (which I would call the “money shot” were this phrase not already in use by some other kinds of movies) included several thousand primitive rocks of various sizes scattered around an enormous model of the gaseous planet. I enjoyed filming this scene the most because the size of the debris was small enough to allow my camera to zoom by them very quickly. You know those home movies taken by our parents during our childhood birthday parties? The movies that, given the tumultuous shaking and jarring of the camera, MUST have occurred during an earthquake? Well that is what Machinima looks like when you attempt to control the camera with the mouse. To glide serenely from planet to planet in my movie, I used the Alt-Zoom camera created by BuhBuhCuh Fairchild. The process basically involved setting waypoints along the path of the intended journey, and then “riding” a camera as you zoom smoothly from waypoint to waypoint. Fraps is then used to capture this glorious footage. To make a good Machinima movie, you will need to be familiar with some post production editing software. I’m fond of Adobe After-Effects, however, Premiere is also a popular product for the job. You should be familiar with a technique known as keyframing, which allows smooth transitions from one effect to the next. For example, I used keyframing to wipe smoothly from one planet scene to the next, and to fade between songs on the soundtrack. It was in After Effects that I edited, assembled, and coordinated the footage, music, and narration for the movie. The final result is the polished, Academy Award hopeful now available on the Alt-Zoom web site. I’m hoping I fired the first shot in a revolution for virtual education. Educational movies utilizing 3D computer generated imagery are no longer six figure productions. On a tight budget publishers can provide movies about molecular models on a CD in the back of college text books, they can allow students to visit the ruins of the Coliseum (or a brand new Coliseum!) or take a ride through the internal combustion engine. We are limited by our imagination, not our coffers. I think Galileo Galilei put it best when he said “The sun is a mass of incandescent gas, a gigantic nuclear furnace.” Well it was either Galileo, or 90’s pop sensation They Might Be Giants, it’s all rather sketchy for me but I DO know that Constantinople got the works, and it’s nobody’s business but the Turks. 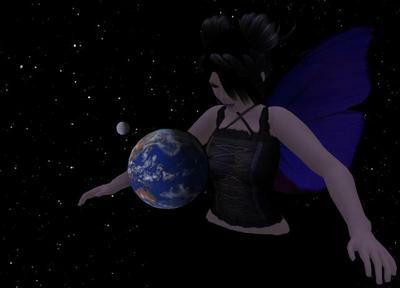 OH, speaking of Turks, I’ve been working closely with the Exploratorium Museum in San Francisco to create a Second Life simulcast of a solar eclipse celebration happening in Side, Turkey. The festivities being on March 29th in the FAME sim, and will include a satellite uplink of the solar event, a breathtaking model of the Roman amphitheater in Side, and a learning museum modeled after the Hayden Planetarium in New York City. Imagine Lollapalooza for science geeks! Attendance is mandatory, so I hope to see you all in class. Aimee once again proves to be an inspirational force in SL. I hope she DOES spawn a machinima revolution here. Kudos, Aimee! Good topic, Hamlet. Thanks for covering this. Amazing work and I look forward to speaking with you about the possibilities for education and Machinima. This is just the beginning of what we can do for education with this exciting new UI for the future.